Is it typical to see cerebellar tissue protruding from a tangential gun shot wound to the head, where the missile itself does not penetrate the cerebellum? 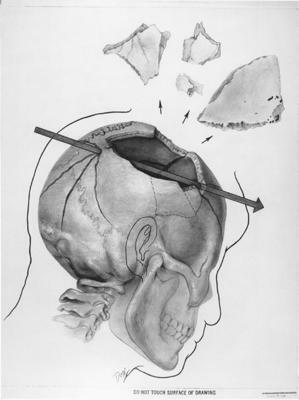 What is the evidentiary significance of cerebellar tissue from a head wound, in terms of the wound's ballistics? Example of bullet path. Cerebellum not affected?